LiveRez CEO Tracy Lotz and LiveRez VP of Development Casey Riley speak to a group of leadership students from Boise High School. This week a number of leadership students from Boise High School visited the LiveRez headquarters to learn more about careers in computer science and web technology. The group of more than 25 students toured the LiveRez headquarters and learned how each department contributes to growing LiveRez and helping our property manager partners. 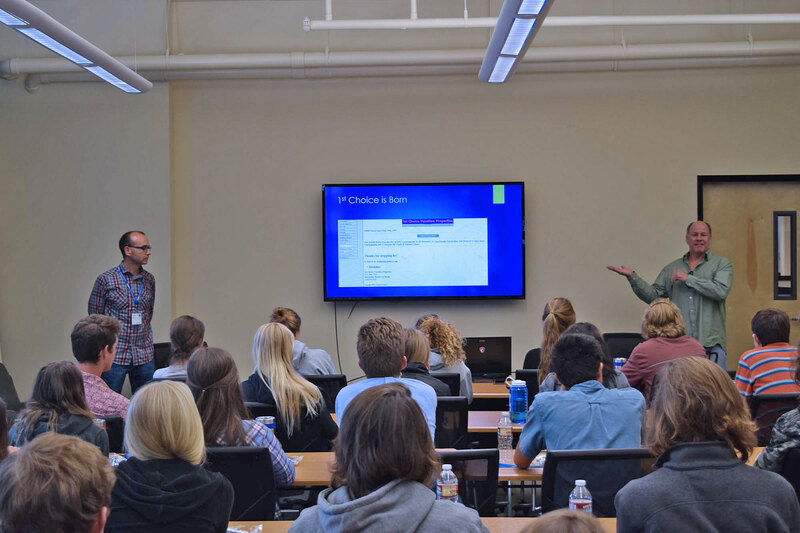 After the tour, the LiveRez development team gave presentations on the different types of roles employees play on the web development and design teams. The group even got a sneak peek at some of the new technology LiveRez is working on. This is the second group of local high school students to visit the LiveRez headquarters in the last month. In April, a computer class from Boise's Bishop Kelly High School were treated to a similar tour and presentations. Check out our slideshow of photos from their visit.